Hey, friends! 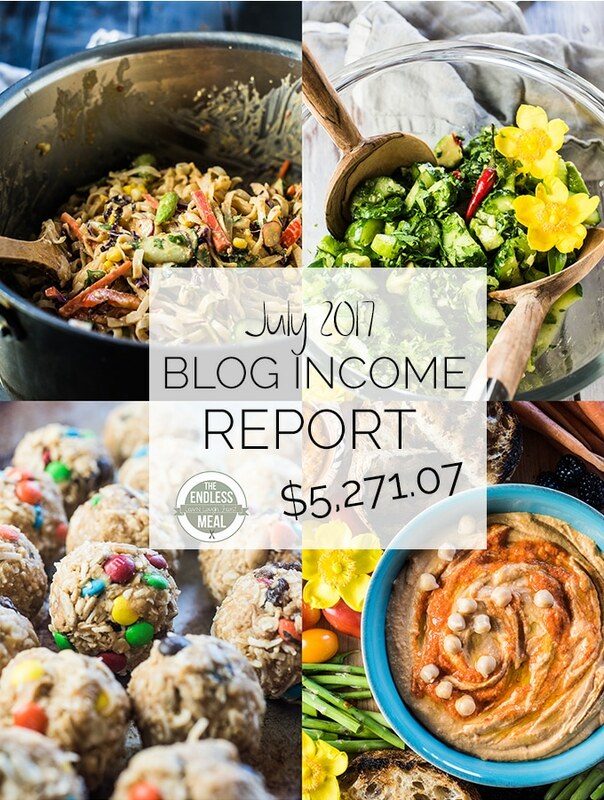 I've set down my camera (and, err, my fork) to share with you July's blog income report. This is the once a month series here on TEM when I share with you some of the behind the scenes details of what goes into running a blog. You'll get a look at how a blog makes money and what expenses a blog has. I know it seems a little strange to get so up close and personal with finances. These are things we normally politely keep to ourselves, after all. But there are a few reasons why I choose to share these with you. 2. To keep me on track. Yep, you read that right. These reports are partly selfish. The parts I love most about blogging are creating the recipes, taking the pictures, and connecting with readers (that's you!) online. Crunching numbers and analyzing data isn't my favorite part but, since this blog is my business, it's an important part. These income reports force me to sit down each month and analyze what's working, and what's not. 3. To (hopefully) convince you to take the leap and start your own blog. I love having a blog. While it is a lot of work, it also gives me a ton of freedom in my life. I get to be my own boss, spend time with my daughter, choose my own schedule, and holiday when I want. I get to be creative every day. I'm constantly being challenged to learn new things. Last year, I created a course to help new or want to be bloggers with the process of starting and growing their blog. It's my way of sharing the love of blogging with you. 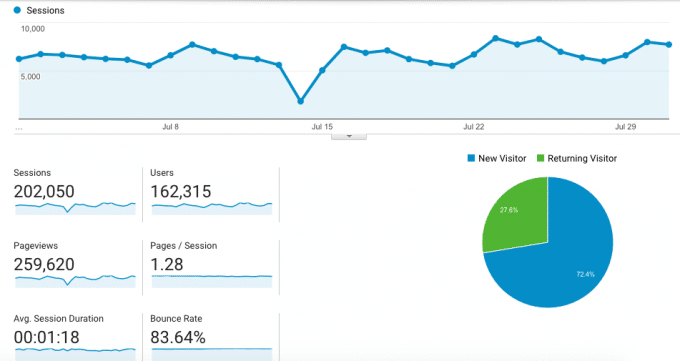 As well as the income report, I also share some blogging tips. This month, I decided to switch email newsletter providers. If you've signed up for my newsletter (which you can do here. just sayin') you may have noticed a few changes this past month. Below the income report, I'll tell you all about why I made the switch from MailChimp to MadMini and how my experience has been with them so far. I had been using MailChimp as the blog's email newsletter provider for as long as I've had this blog. Or at least since I started sending out notifications when I post new recipes. MailChimp was great to start with. It's free until you have more than 2,000 subscribers (which is a huge number for a new blog) and it's easy to set up and start using. 1. Money. As your subscriber list grows, it gets expensive. Based on the amount of traffic I was getting from the newsletters, I was only barely breaking even. At the time I made the switch, I was paying $95/ month to MailChimp, and making around $105 per month from the traffic it sent. Based on the current number of subscribers on my list today, I would be paying $125/ month. With MadMimi, I'm paying only $59/ month, and have room to add over 3,000 more subscribers before I bump up to the next tier. It just makes sense. When I reached out to MadMimi with some pre-sales questions, I literally received an email back within two minutes. I was blown away. I had the same experience while transferring the lists and setting up new email templates. Each email I sent was answered promptly and in detail. When I moved to MadMimi I created a system to allow subscribers to choose the types I recipes they want to see. Many of the people who read TEM follow diets that restrict what they eat. I know that someone who follows a vegan diet wouldn't want a recipe for a juicy steak showing up in their inbox. And I would guess that someone who eats paleo wouldn't be interested in a quinoa salad recipe. Now, when someone subscribes to my list, they can choose to receive all the recipes, or they can choose which recipes they want based on their diet. They can also change their preferences at any point. I've accomplished this by creating lists for different diets. Unlike MailChimp, MadMimi only charges once for each email address no matter how many lists that address is on. Since switching to MadMimi and giving subscribers the ability to choose the types of recipes they want sent to them, the open and click rates have gone up and the unsubscribe rate has gone down. The open rate has increased by 25% – this is called ‘Views' in MadMimi. The click rate has increased by 80% – this is called ‘Engaged' in MadMimi. The unsubscribe rate has decreased by 78%. While I was expecting the results to be positive, I was blown away by how much better the newsletters perform when subscribers are given the option to choose lists. Takeaway: give your readers the ability to get the recipes they want. Have you tried segmenting your lists? Do you think it would work well for your blog, too?